Introduction: This is another homemade digital clock with LED displays, displaying in HH MM SS form in 24h mode. IT is built from only primitive logic CMOS circuits series 74HC and 4000, without special purpose circuits or microcontrollers, without programming. It is in a retro style - all parts used already existed in the 1970s - 1980s. 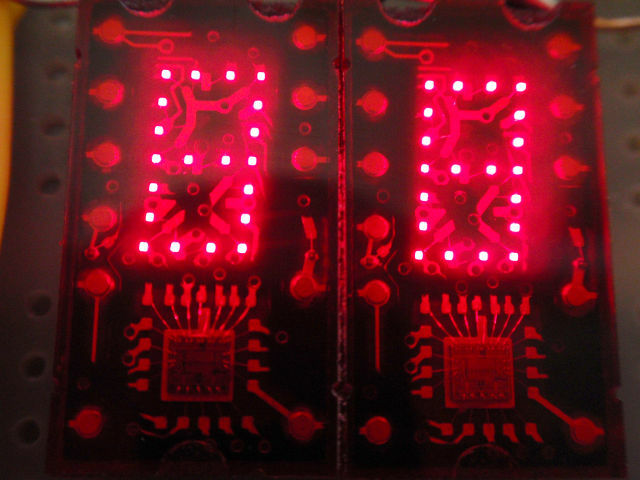 Description: I have used oddball LED displays. They have built-in BCD decoders, you dont need any BCD to 7 segment decoders. 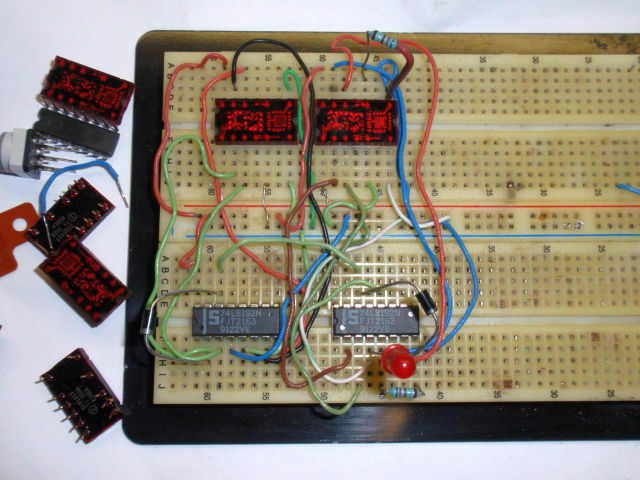 However, you can use ordinary 7 segment displays in combination with the 7 segment decoders, such as 7447 or 4543. My displays are DIS1417 (equivalent of TIL311), whose production started cca back in 1972. 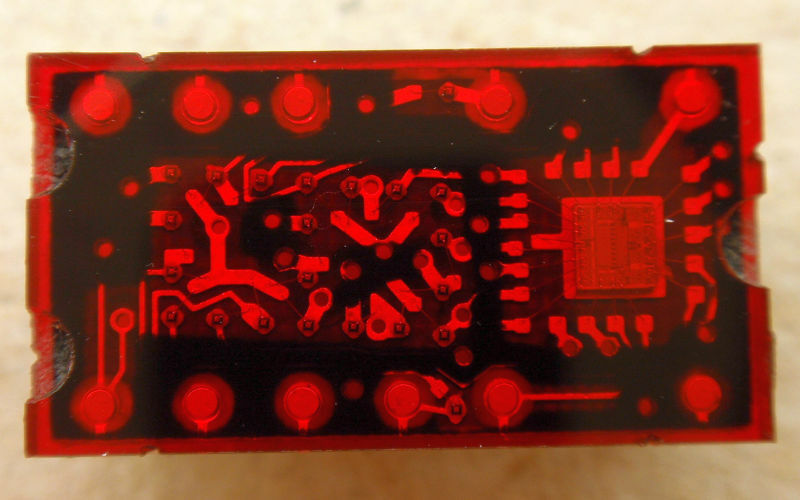 They have deep red light (660nm). Because of the old technology, they draw a lot of current. They also have a built-in LATCH, but I did not use it. 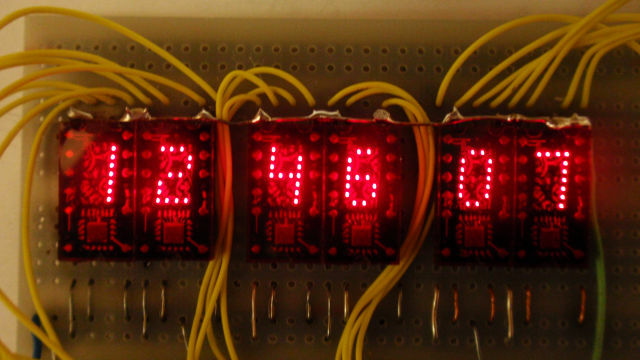 The displays use unusual way to display numerals - a 20 dot system. The dots are arranged into 13 groups (6 of one and 7 of two). More information you can find in TIL311 datasheet. Displayed numbers look far better than the classic 7-segment, they are not rectangular. Such displays, however, are now relatively rare. I have built two versions of a clock with those displays. Version A used decade counter circuits 74HC192. Version B uses a double decade counters 74HC390. The advantage of the version B is that it achieves the same functionality with about half number of parts :). Both versions have the same timing circuit with 4060 (oscillator + binary divider) and a 32 768 Hz (215 Hz) crystal. It must be a Murphy's Law - commonly used crystal frequency is 215 Hz, but the 4060 only has 14 binary dividers :), and thus the lowest frequency output (pin 3) is 2 Hz. It should therefore be further divided by two in order to get the necessary 1Hz. The first version of the clock solves this by one more 74HC192 (IO2). Later version B solves this binary dividing using the binary divider in circuit 74HC390 (IO2). Decade counters in 74HC390 are actually separate base-5 and base-2 counters. For tens of hours, the base-5 part is enough (it only counts 0-1-2), so that the base-2 part can be used to get 1Hz from 2Hz. Setting the time (both versions) is performed using TL1 and TL2 buttons. Buttons bring an increased frequency to the input of counter chain. First, set the hours with button TL1 and then minutes with TL2 button. Resistors R3 and R4 prevent collision of two or three outputs during setting. R4 prevents collision of pin 6 with pin 9 when both buttons are accidentally pressed at the same time (a good engineer must expect this). C3 is used to debounce the buttons. Version A after minor modification can be used as a stopwatch or kitchen timer. 74HC192 circuits also have reverse counting mode and preset function, so the clock can be modified for countdown or for setting using decade switches. To power the clock you can use any supply of about 5V (4-5V). Clock draws around 0.4 to 0.5 A, most of it taken by the old displays. Schematic of a homemade digital clock version A - with 74HC192 and DIS1417 / TIL311 displays. 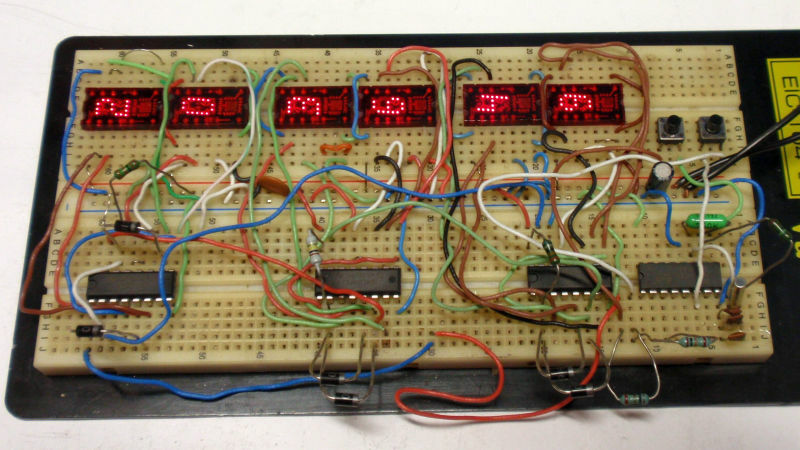 Schematic of a homemade digital clock version B - with 74HC390 and DIS1417 / TIL311 displays. Numbers 0 - 9 on DIS1417 / TIL311. 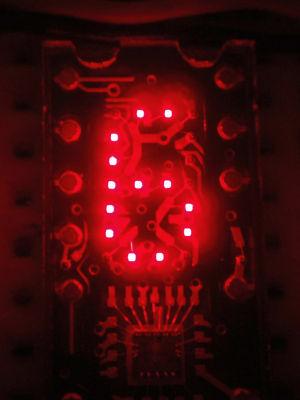 Display of version A clock shining. 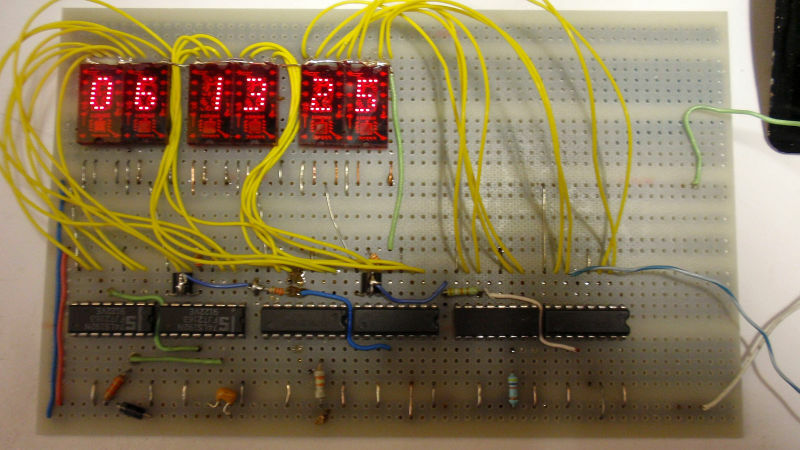 Completed homemade digital clock (version B) in breadboard, 3x 74HC390 and 1x 4060. 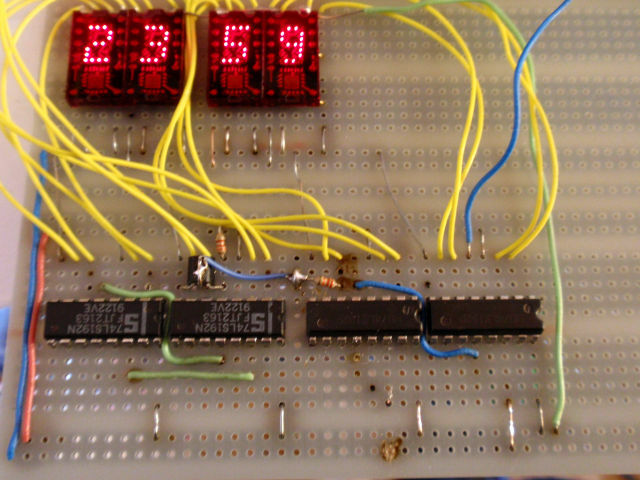 Completed homemade digital clock (version B) on a universal PCB board, IC's are 3x 74HC390 and 1x 4060. Testing the homemade digital clock (version A) using 1Hz, 10Hz, 100Hz and 1000Hz input signal :). 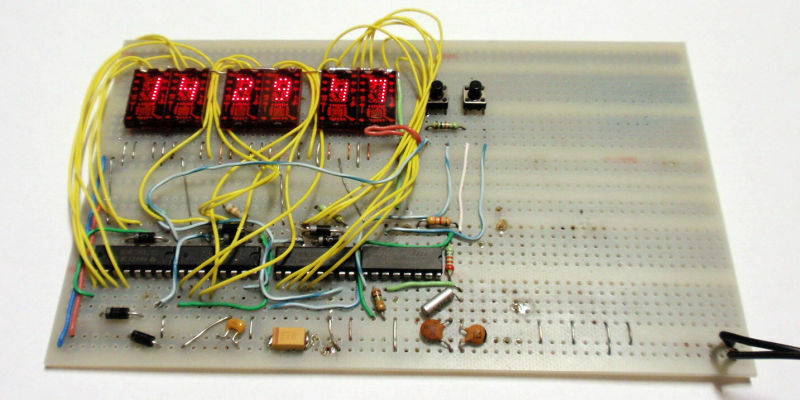 Completed homemade digital clock (version B).